This 80W Sunshine Flexible Solar Power Caravan & Motorhome Kit offers outstanding performance and great value for money. 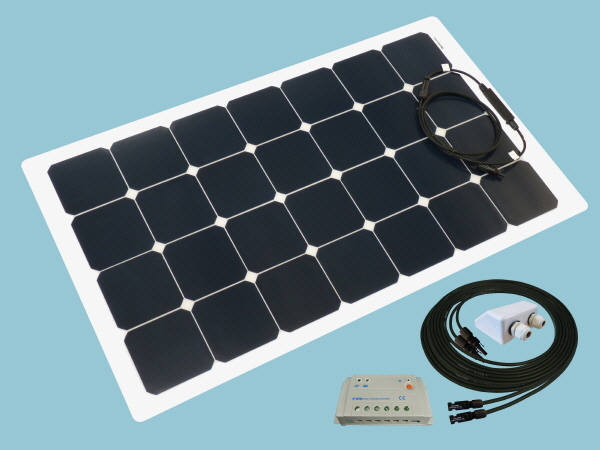 With this 80 Watt solar power kit you could expect to generate around 17 amps per day during the summer months supplementing the 12V leisure battery power in caravans, motorhomes, boats etc. This Sunshine Solar Flexible Caravan & Motorhome Kit includes a choice of either a single battery charge controller for one battery bank typically used in caravan solar set-ups or a dual battery controller for optimised battery charging of two battery banks useful for those of you wishing to keep both starter and leisure batteries charged commonly used in motorhome solar set-ups. The Sunshine Flexible Solar range benefit from being thin, light and when fitted to the roof of a caravan or motorhome very aerodynamic. Light weight design combined with high efficiency cells and a 20°- 30° solar panel flexibility makes our flexible solar range perfect for caravans, motorhomes.